These stores are filled with amazing things. It’s mysterious, like a treasure hunt, mostly because we rarely know what products do unless there is a helpful tag line in English which is rare (and often misleading). I’ve heard stories of foot peels gone awry leaving the bottom of your feet raw; moisturizer that is actually face bleach and mascara that is so waterproof that it needs the cosmetic equivalent of paint thinner to remove it. However, that does not scare us as the potential rewards are fabulous. They have amazing face masks, pre-soaked with solution (aloe, mushrooms, lavender, bee pollen, snake venom); rose-flavoured toothpaste; body gel that has some tomato product in it that burns fat; and probably the best sunscreen on the market by Anessa which is Shiseido’s drugstore brand. They’re also not afraid of using facial and hair oils–cosmetic giant Shu Umera makes a legendary facial cleansing oil that has been on the market in Japan since 1967. 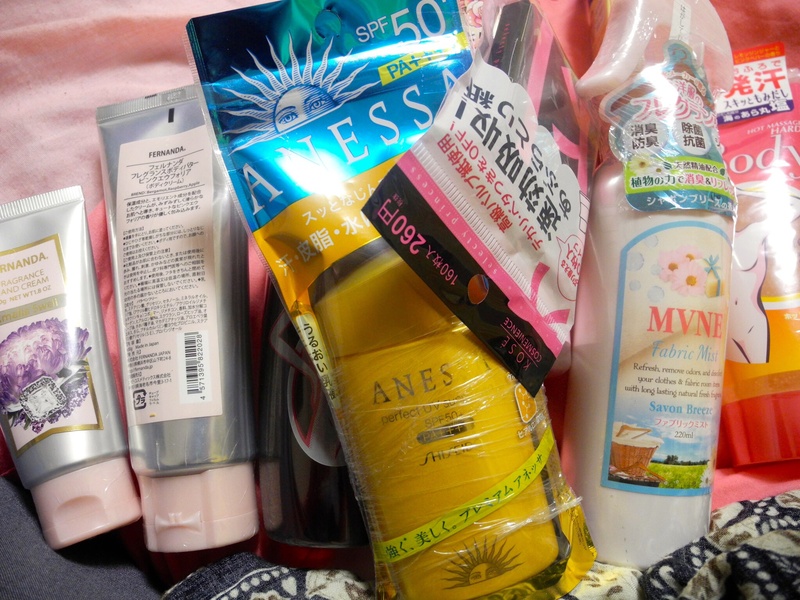 The Japanese spend more on cosmetics than any country in the world which has resulted in a lot of money spent on research and development, particularly for sun protection. They have a number of organic and natural cosmetic lines as well and the drugstore brands are far superior to ours…just wish we could read the labels! The department stores here are epic. There’s not really any other way to describe them. They’re huge…4-10 floors including a basement and possibly a sub-basement or two. They usually have food like groceries as well as take-out boutique-style food. I mean serious food here…all kinds of Japanese food, Korean barbecue, French patisseries, Italian delis, butchers, bakers, fromageries, chocolatiers…it’s quite something. Anyway, the food does not stop here. There are usually cafes and restaurants interspersed amongst the floors in case of starvation…think high-end food court. There are often art galleries and museums on the top floor as well as public spaces and sometimes even theatres and movie theatres. Up until today I’d only been shopping but today I did my first gallery tour at Hikarie Shibuya. I saw an exhibit on Japanese puppets (amazing), an installation on travel with various ‘objets’ and a modern art exhibit. Hikarie has two floors of restaurants and cafes. And it was packed. I guess having such a huge population supports stores like this…think Holt Renfrew (10x bigger) with about 20 stores in the downtown area. For the most part, most department stores sell fairly high-end goods and many are boutique style, housing top designers within each store. They usually have a gift section and a kimono department in addition to the usual fashion, household goods, and beauty departments. The customer service is amazing…if you go right at opening time (usually 10 or 11am), all the staff stand at the door and bow as you enter. They also bow whenever they leave the floor by turning to face outwards, bowing (even when there is no one there) and then going through the door. You rarely have to wait…if they see a lineup forming clerks will rush to a till to serve you…so that you, the honourable customer (o-kyaki sama), does not have to wait. It’s quite radically different from shopping at the Bay.